I have so many blog posts to catch up on, but I survived my last week of field sampling, yay! No more boat for me. While it was a fun experience and I enjoyed getting to knit during the downtime on the water, I’m glad it’s over. No more 13 hour days! I’ve missed my me-time. I finally added in the third colorway (SG Bugga, Fierce Snake). Yay! Short rows are fun. 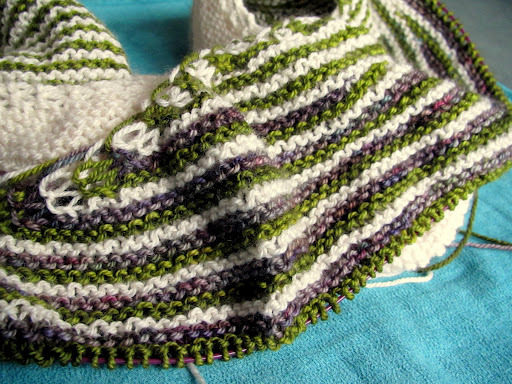 Right now they’re still tiny short rows, too, so I feel like I’m making a lot of progress, which is always nice. Soon they’ll get super long, though. Kind of harsh, but understandable since the name is their trademark. Anyway, knitters have gotten quite up in arms and the committee sent a couple of apology letters… the whole thing seems mightily blown out of proportion. But then again, I don’t participate in the Ravelympics nor do I watch the Olympic games (no cable TV or time for TV anyway) so I suppose it isn’t relevant to me. I just hope the knitters who are getting all angry remember to try not to give the Muggles a bad impression of what the rest of us knitters are really like. Knitters are nice people, don’t be obnoxious! You can read more about it on the New York Times blog and on the Yarn Harlot’s blog as well as the Craftsy blog, and elsewhere, I’m sure, if you google it. I hope you all have a wonderful weekend. I feel like celebrating my freedom, so I foresee a lot of sunshine, outdoors time, relaxing, spinning, knitting, and perhaps an adventure or two. This entry was posted in blogland, shawls by shoelaceswitcher. Bookmark the permalink. YAY! No more boat! But I love your shawl, keep it up, it will be stunning. Field sampling? Sounds like fun! I love how the shawl is looking. I've seen a few of those stripy shawls recently, and I have really been wanting to knit one of my own because they just look so cute!